While I hesitate to start any food-centric column with a tale about cleaning up after my dog, experts tracking whether or not single-use plastic bag bans have slowed environmental damage tell me that, at least for now in Maine, anecdotal information represents important evidence. My lovable mid-sized mutt Theo and I were walking on the Bowdoin College campus one day in early June when I realized I was out of biodegradable dog waste bags. The crucial time was imminent so I called my husband, whose office building sits on the same quad, and asked him to bring me a plastic bag pronto. Fifteen minutes later, he arrived, huffing, with a bag big enough to hold the entire dog, not just his pile of poo. Although the bag ban in Brunswick had been in effect only since the previous September, this oversized bag, from a shoe store, was the only one he could find lying around. Before the ban in my town, finding one of the more than 100 billion single-use plastic bags handed out to Americans annually nationwide (most of which end up in landfills or as litter) would have been a given. Kirstie Pecci is a senior fellow and zero-waste director with the Conservation Law Foundation in Boston. She can point to long-term studies conducted in the other Portland in Oregon; San Jose, California; and in Washington, D.C., that showed a measurable reduction of litter found in storm drain systems and pulled from creeks and rivers since bans in those cities took effect 10 or more years ago. A paper released by University of New Hampshire environmental and resource economics professors in 2016 tracks increased efficacy of bans where communities also imposed 5- or 10-cent fees on paper bags handed out by stores should customers not have their own reusable tote in tow. But since Maine’s municipal bans are, in general, quite new, the empirical data has not yet been amassed. “So the anecdotal evidence is key to keeping up momentum, encouraging more local bans and moving toward state-wide legislation,” said Pecci who is pushing a statewide bag ban and fees in Massachusetts, a measure that suffered a setback recently when the legislature dropped it from an environmental bond bill. When asked where I could direct readers interested in seeing even anecdotal progress, Pecci suggested that litter cleanup crews take pictures of past problem areas – like along chain-link fences – over time to record evidence of fewer bags. 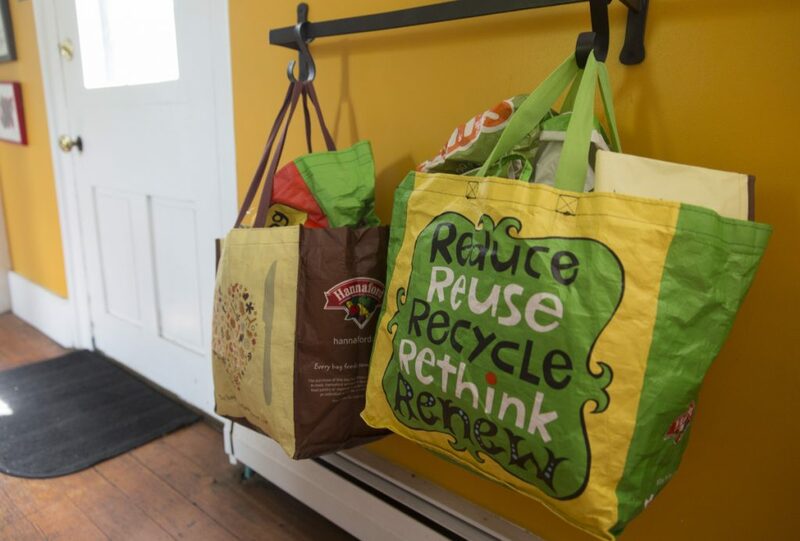 Ecomaine Communications Director Matt Grondin reported that member communities of the nonprofit waste management organization where bag bans are in place all report a reduction in the number of single-use plastic bags they see lying or flying around or incorrectly stuffed into recycling bins. “But it’s not a weight issue that they can quantify at this point. It’s more of an assessment of the ‘look of things’ in their communities,” Grodin said. Tracking how many customers have switched to reusable bags overall is difficult given that customers’ reusable bags come from disparate sources. Hannaford does know the number of reusable bags it sells. The Hannaford Cause Bag Program triggers a $1 donation to either a local hunger relief effort or an area charity every time a customer buys one of those totes. The sale of these bags has collectively raised more than $700,000 for charities across the New England region. “We estimate that together, the sale and use of those bags has replaced more than 10 million single-use bags,” Blom said, adding that the company has also rolled out a 50-cent reusable bag program to make the prospect of using them even more affordable. Last Sunday evening, as I walked through the parking lot at the Brunswick Hannaford and noticed that shoppers were either carrying their reusable bags or even carrying their groceries in their bare hands, I smiled at the evidence that the bag ban is indeed working in my neck of the woods.